Rare and hard-to-find vintage Lie Nielsen planes, Stanley Bailey planes, and other vintage and collectible carpenters planes. Find Lie Nielsen bronze planes, Stanley No. 1 smooth planes, Sweethearts and Bedrocks and other antique block planes, scrapers, jointers and parts for vintage planes. Stanley special cutter blade sets with the original wood box, rosewood knobs and tote handles, lever caps, frogs, spurs and other plane parts. 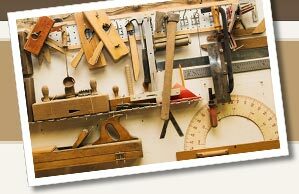 See more vintage and antique carpenter's tools at CarpentryCollectibles.com. If you still do not find what you need, you might try The Electronic Neanderthal Woodworker site. Stanley Wood Plane Handyman Vintage USA 14" Metal Woodworking!